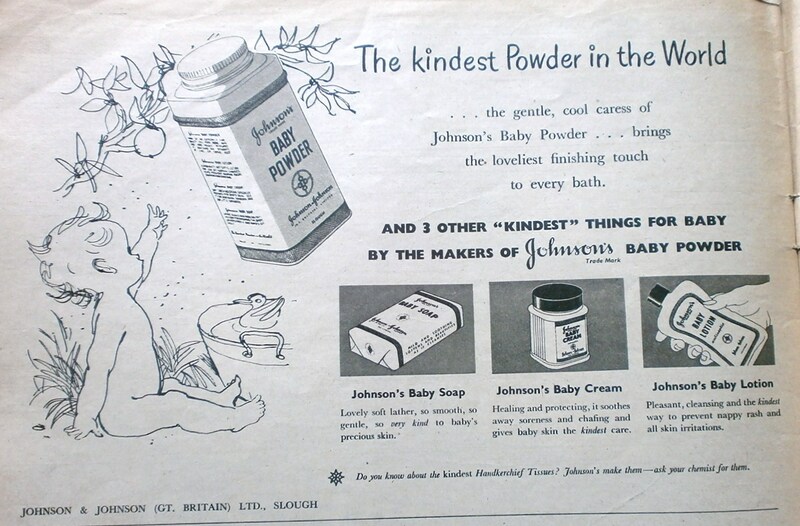 When you examine many of these adverts en masse – not only the baby related ones – the general feeling seems to be that if there is a product, new ingredient, new thing that can be used, given, delivered, rubbed in and so on, then do it! Everything seems to be the most unique, the ideal, the kindest, safest, most natural thing you can have or use. 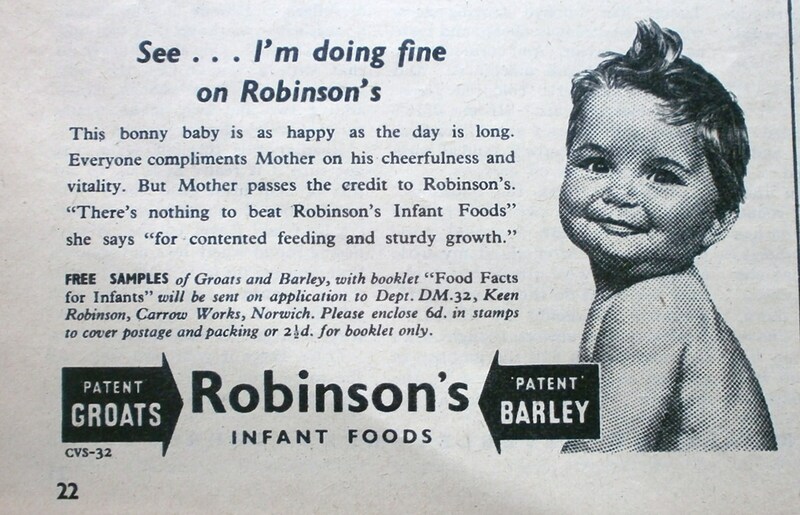 I know that’s the nature of advertising, but I do wonder how much more susceptible people were to it fifty or sixty years ago. 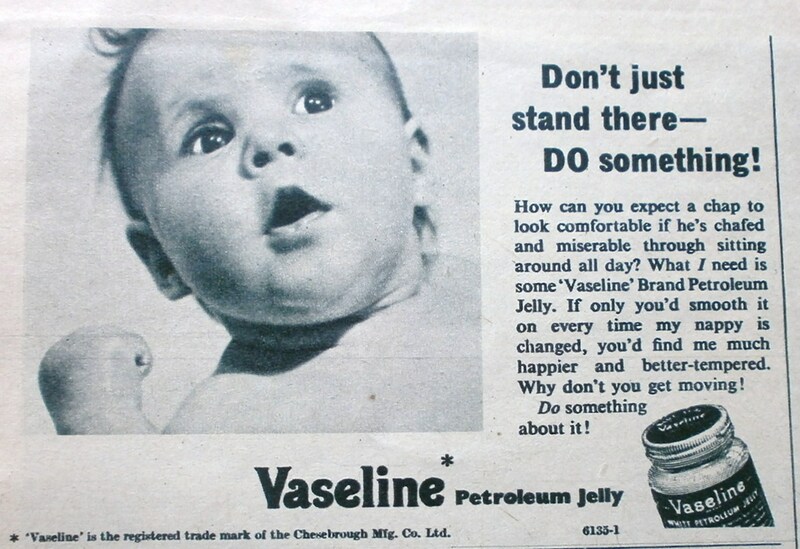 Nowadays, I think (most) people are more cynical and will question advertising spiel more; perhaps I’m being naive in assuming people of the older generation didn’t do that as much. This Heinz advert has one of my favourite lines in it: “‘So firm, isn’t she! no flabby fat on her. And she can almost stand.” Pitched just right to play on the fears of a mother and the natural competitiveness of rearing a child and wanting it to be the best it can be and secretly better than everyone else’s child. Just read the different in the copy between the adverts. 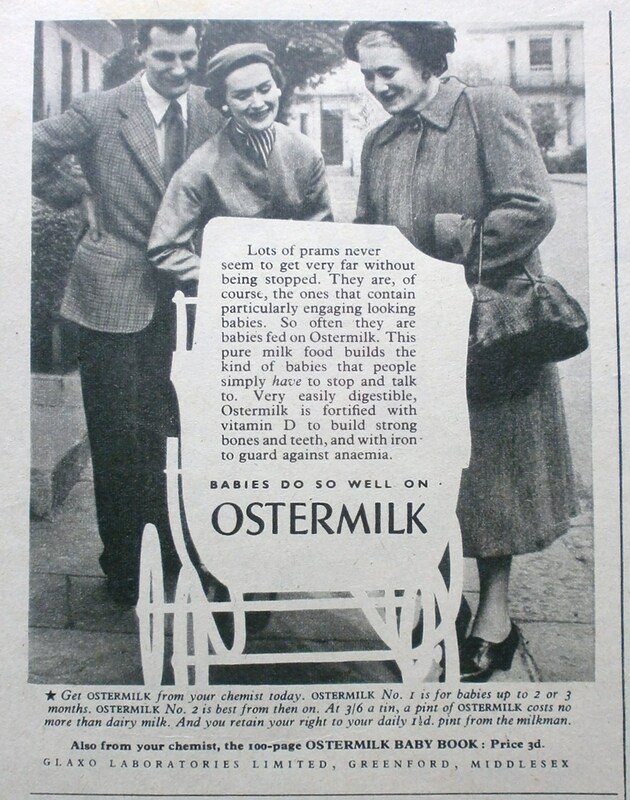 The first states that for ‘Mothers who cannot breastfeed [they] can put their trust in Ostermilk.’ So far, so responsible. 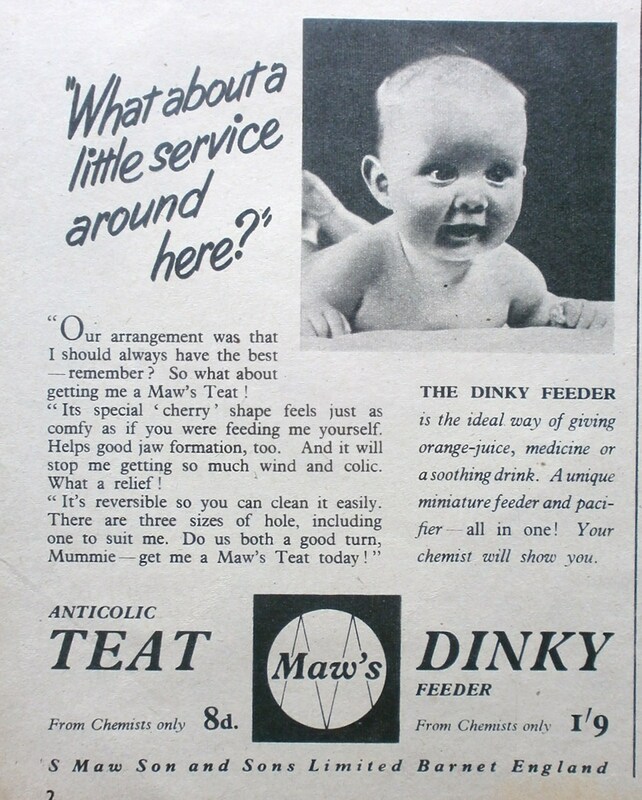 Yet look at the text for the second advert: “Lots of prams never seem to get very far without being stopped. 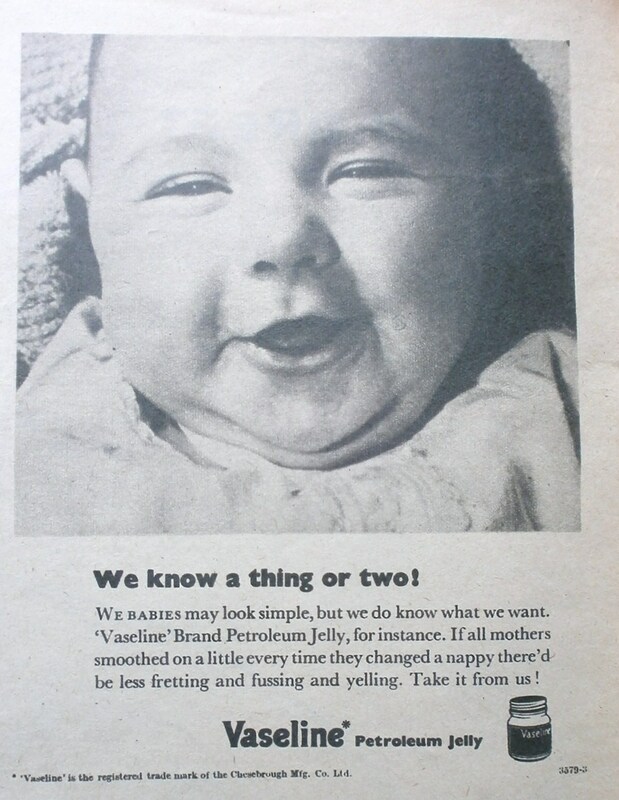 They are, of course, the ones that contain particularly engaging looking babies. 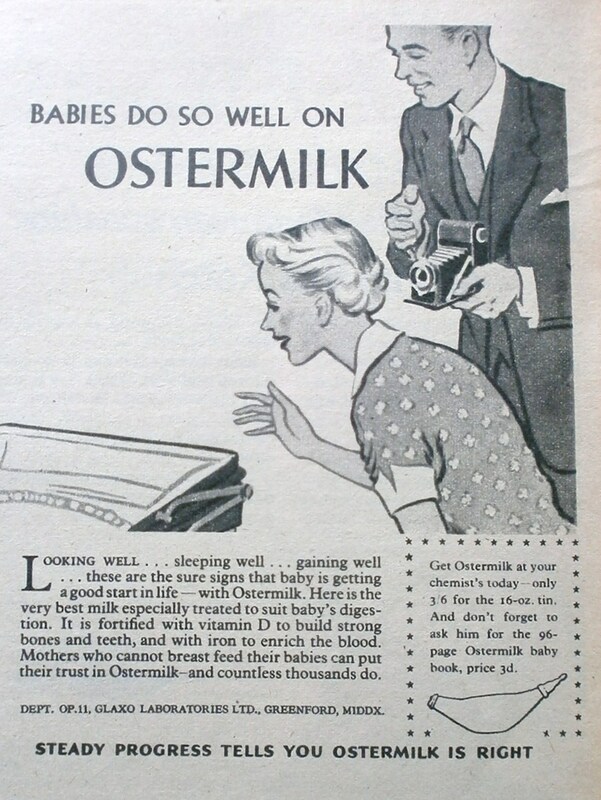 So often they are babies fed on Ostermilk. 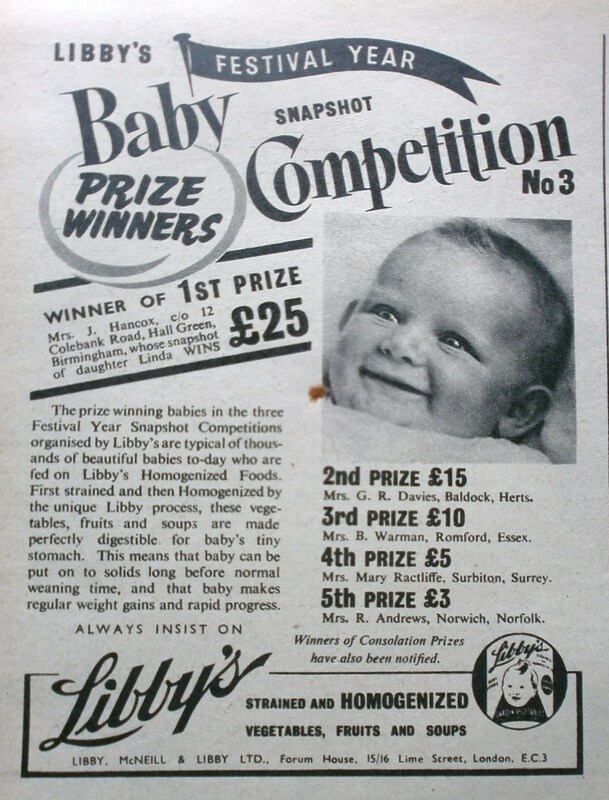 This pure milk food builds the kind of babies that people simply have to stop and talk to.” As I said, designed perfectly to play on fears and competitiveness. 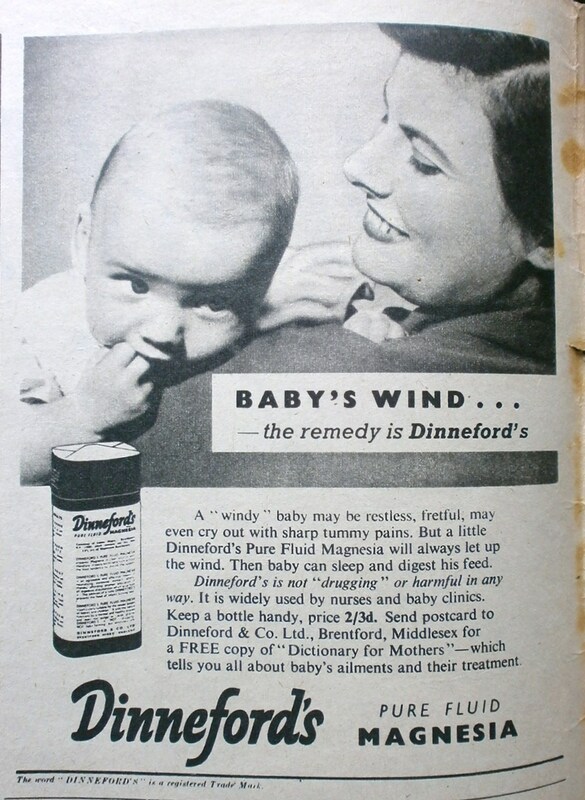 The breastfeeding vs. formula feeding debate still rages on endlessly nowadays, and there is an absolute wealth of information out there for mums and dads to be read about. It really is down to personal choice and circumstances, in my opinion, and I don’t think any parent should be made to feel guilty about that choice. 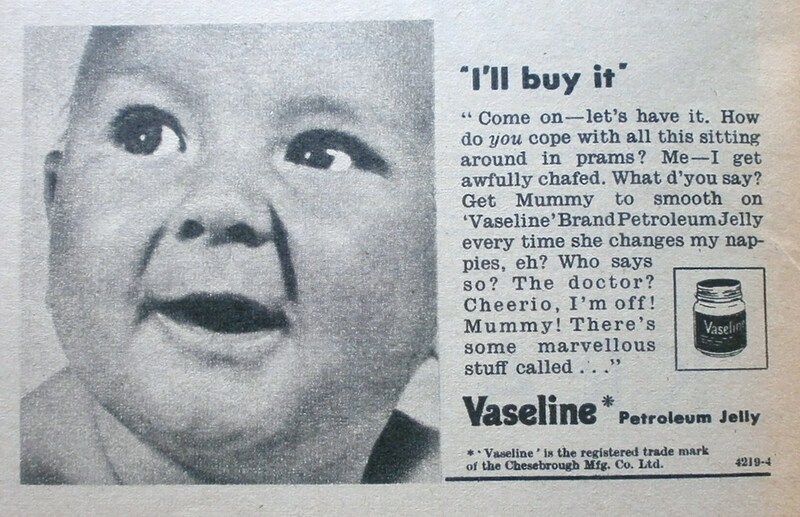 I love the expressions on the faces of the babies in the Vaseline adverts and the RP accent of the text. Jolly good! 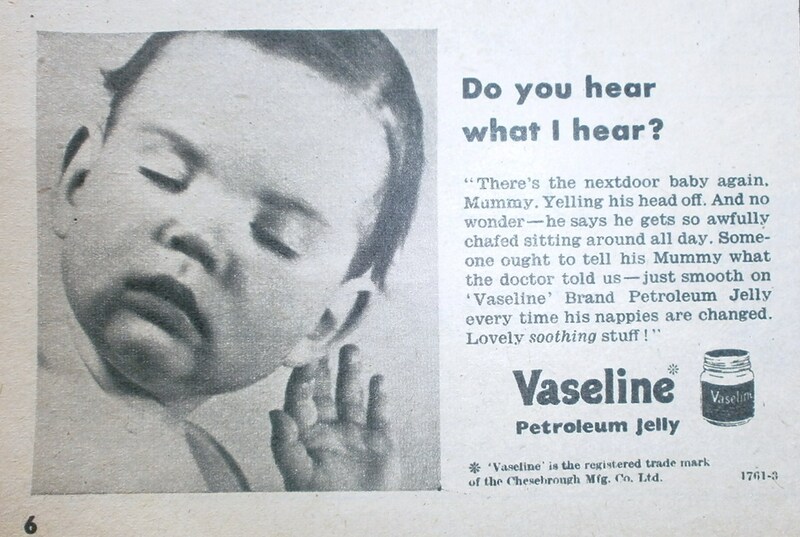 The idea of my baby thinking in a posh accent tickles me somewhat. In reality, it’s likely to be a strange hybrid of Yorkshire, Mancunian and the Midlands. Perhaps I can teach him or her to say, “I say!” at least. My mum couldn’t have butter during her pregnancy with me so resorted to toast with mayo… I bloomin love the stuff! It was classical music with my brother, somewhat more refined! 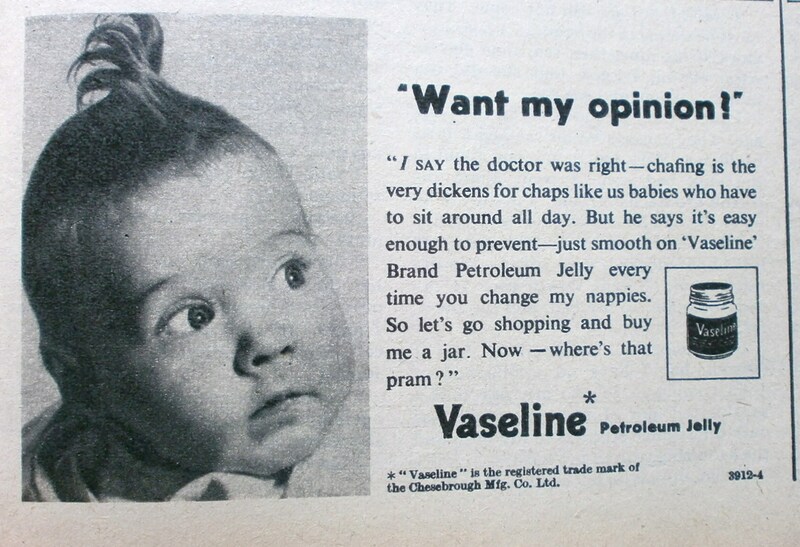 Love the pictures of the Vaseline babies! Oh and don’t worry, Richard and I can teach Hovis how to speak propah!! 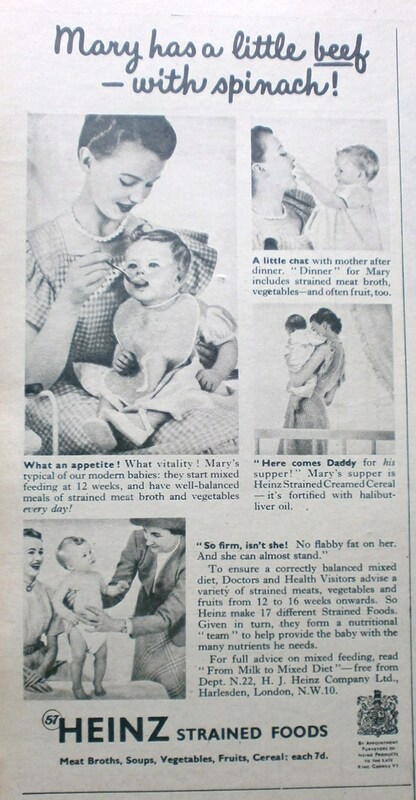 I was ” vegetarian” when pregnant -could not tolerate meat in any form or shape, could not stand the smell of it …couldn’t be near the butchers department…. had twins , 3.2 kg and 3 kg ! Was the same weight after as I was before I became pregnant, and never felt better. How is the baby blanket doing??? ?